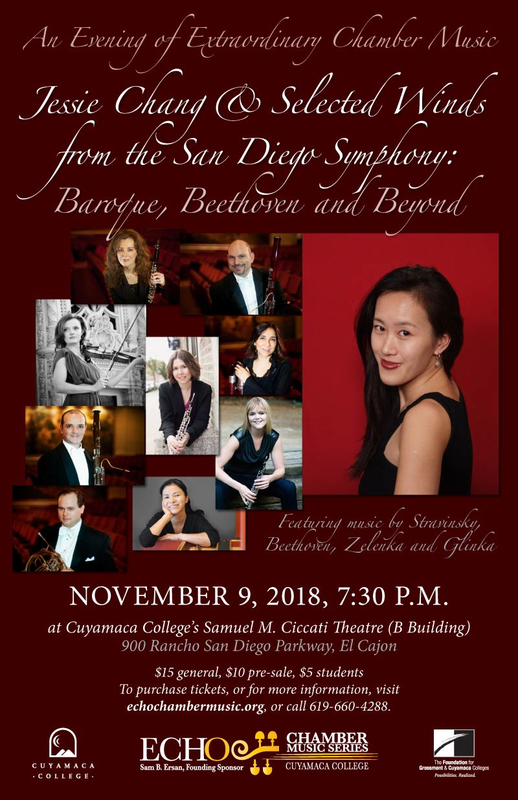 Winds from the San Diego Symphony will join pianist Jessie Chang in a unique chamber music concert set for Friday, Nov. 9, at Cuyamaca College’s Samuel M. Ciccati Theatre. 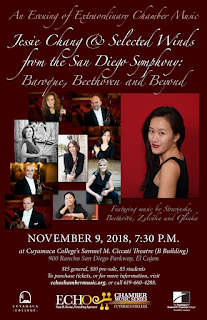 Jessie Chang & Selected Winds from the San Diego Symphony: Baroque, Beethoven and Beyondwill feature an all-star cast of classical musicians in the latest ECHO Chamber Music Series that is being underwritten by Sam Ersan, vice chairman of the San Diego Symphony Orchestra’s Board of Directors. Among the works being performed are Jan Dismas Zelenka’s Trio Sonata No. 3, Igor Stravinsky’s Pastoraleand Ludwig van Beethoven’s Quintet for Piano and Winds Op. 16. Such an all-star cast of classical musicians have rarely performed at a community college in the region. Chang has been featured at Carnegie Hall’s Isaac Stern Auditorium, has collaborated with major orchestras across the globe, has earned top honors in more than 30 distinguished national and international piano competitions, and plays regularly with members of the San Diego Symphony. Others being featured on Friday include Sarah Skuster, the San Diego Symphony’s principal oboist; Andrea Overturf, the Symphony’s English horn; the Symphony bassoonist Leyla Zamora, who for more than a decade served as principal bassoonist at the Memphis Symphony; Symphony Second Bassoon Ryan Simmons; harpsichord player Takae Ohnishi; the San Diego Symphony’s Principal Clarinetist, Sheryl Renk; Symphony Principal Bassoonist Valentin Martchev; Symphony violinist Julia Pautz; and Darby Hinshaw, a former principal horn player with the Marin Symphony who joined the San Diego Symphony in 2011. General admission tickets are $15, or $10 if bought in advance. Student tickets are $5 each. Tickets can be purchased and further information can be found at EchoChamberMusic.org. Cuyamaca College is at 900 Rancho San Diego Parkway in El Cajon, 92019. The ECHO Chamber Music Series – ECHO is an acronym for the East County Harmonics Organization – debuted this past spring and is aimed at bringing some of the world’s top young musicians to Cuyamaca College’s Samuel M. Ciccati Theatre. Six concerts are tentatively on tap for the coming spring, including: Quicksilver Baroque (Jan. 6); a piano/viola recital with Reiko Uchida and Brian Chen (Jan. 29); the Myriad Trio (Feb. 19); the Smetana Piano Trio (Feb. 22); the Fauré Piano Quartet (March 18); and Augustin Hadelich and Orion Weiss (April 19). Hadelich is playing with the San Diego Symphony in February but is returning to the region for the April 19 concert at Cuyamaca College.